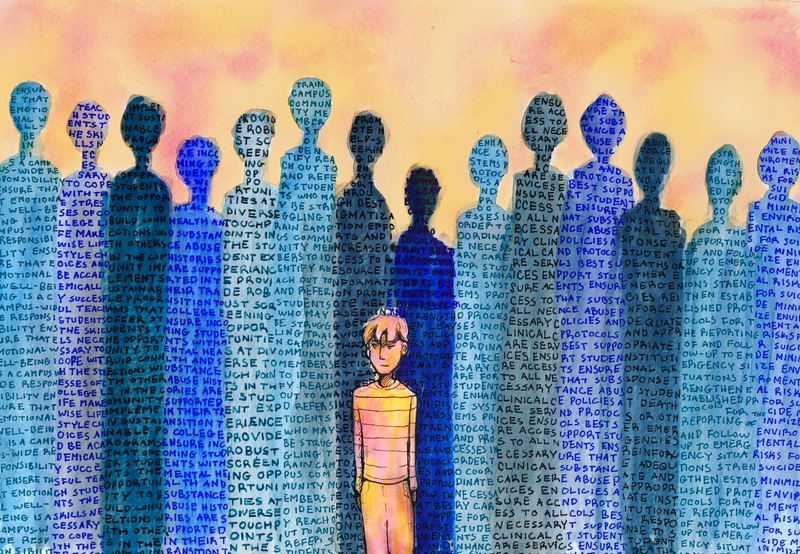 Content warning: This piece addresses issues of mental illness and suicide. On the heels of the anniversary of the string of student suicides that shook the Columbia community last January, Dean James Valentini sent an email announcing the results of a year-long study by the Jed Foundation. But the long-awaited objectives in the email lacked actionable changes, and what was meant to serve as a plan to “enhance well-being in our community” instead read as hollow, vague, and out of touch with the time-sensitive urgency with which undergraduates view mental health reform. Our community needs hope now more than ever, in the form of real, tangible changes that will make our college experience better before we graduate. Rather than hope, the email simply offers a set of “14 key objectives” that not only provide no actionable steps to tackle mental health on campus but also in fact do not seem specific to Columbia at all. And so, just over a year after Spectator’s previous editorial board sat down to discuss the issue of mental health at Columbia, we find ourselves again asking to hear more from the administration on what will be done to address this issue. Administrators said Valentini had not included these actionable steps in his email due to the JED steering committee’s adherence to JED’s multi-year timeline. They declined Spectator’s request to make those concretely achievable recommendations public. The steering committee is a group of individuals with a thorough understanding of the needs of the Columbia community, while JED has expert advisors dedicated to putting forth solutions to address mental health concerns on campus. If the team behind these initiatives is comprised of experts, what is behind the reluctance to share their plans with the community? Why are students still being kept in the dark regarding the breakdown of objectives to address mental health? Adherence to a timeline is not a justifiable reason to withhold this source of hope from our community. This is not to say these action steps will not be sufficient in addressing concerns, but by refusing to make them public, the steering committee does not even allow for students to make this judgment for themselves, let alone offer feedback. After all, feedback and suggestions have often been the precursors for institutional change on campus. While we recognize that institutional change takes time, we are also painfully aware that our time at Columbia is limited. The year it took the administration to form and communicate plans to combat the mental health crisis on campus comprised nearly a quarter of the average amount of time a student in any of Columbia’s four undergraduate schools spends on this campus. We have been asked to rely on each other far too often in the past few years. And when students have come together to plead for specific administrative action—forming their own demands in response to the lack of potential changes made public by administrators—many of their requests have been rejected. We agree with Valentini when he says that “the only acceptable number of student deaths is zero.” To echo the words of one of our contributors, “[we’re] tired of seeing people die.” For this reason, we ask that administrators show our community the steps they have outlined for the University to act on that sentiment before another student’s time on campus is cut short. Barnard’s Rosemary Furman Counseling Center (212-854-2092) offers appointments from 9 a.m. - 5 p.m. and after-hours resources. RAs are available in all residence halls and may be reached by contacting the RA on call. To reach the National Suicide Prevention Lifeline, call 800-273-8255. The authors are members of Spectator’s 142nd editorial board. News Editor Rahil Kamath recused himself from contributing to this editorial due to his coverage of the issue.